Let the ocean breeze carry you away. Enjoy a tranquil and private escape to Great Exuma, Bahamas at Breezy Hill. Ranked "Excellent" on TripAdvisor, and a multi-year winner of their "Certificate of Excellence", location, service, and amenities meet to create the perfect vacation rental for your Caribbean getaway. There are two vacation homes for rent right next door to each other, allowing larger groups to divide into two, which usually makes for a much more easy vacation. For instance, you can put the late-nighters in one home and the early risers in the other. A stunning view, a private beach, and a LIVE REEF are a 'hot snorkel spot' put the locale at the top of the list. If you are in search for a tranquil place as your vacation headquarters. You will feel like you have escaped to your own island. The rates are another feature that makes 'Breezy Hill' an easy choice. Their weekly rental price is very affordable, and with all the amenities a home offers, it is value-infused too. For retirees and military personnel be sure to ask about special discounts. Modern amenities like WIFI, satellite television, and international phone calls are found and much appreciated. Also each home features a fully equipped KITCHEN! Owners, Esther and Larry are exceptional at customer care. Having lived on the island for over 35 years they are inside experts at everything Great Exuma. They actually meet you at the airport to bring you to your car rental and will even arrange your car rental for you in advance of your arrival. Great Exuma has as much to do, or not do, depending on your mood. The luxurious beaches, delicious cuisine, and welcoming locals are a few reasons that this island stands out. It is very safe to explore on your own, and FUN too! A quick drive will tell you how beautiful it is here. BEACHES everywhere! This is where you can go to SWIM with the FAMOUS EXUMA PIGS, challenge yourself to the Greg Norman Championship Golf Course, visit a spa or have a massage right at the house. The Taylors will arrange it all for you. Available for rent by the day, week, month, or longer you can rent one or both homes in their entirety, or just an individual ROOM in the MAIN HOUSE. 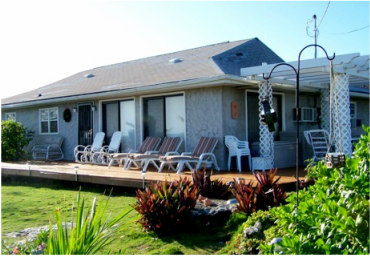 The Main House and Guest House have a private beach for your getaway, complimentary WIFI, telephone calls and all the amenities of home ensure a budget-friendly, comfortable, and convenient getaway. You can opt to only rent a room or you can rent the entire home. Two large bedrooms with private en-suite ensure a comfortable stay even if there is a guest in the other bedroom. One of the rooms also comes with a day bed for children to accompany you and for smaller families this might be the perfect solution. You will have full access to the large kitchen and living room. Cooking some of your own meals means that you save more money! 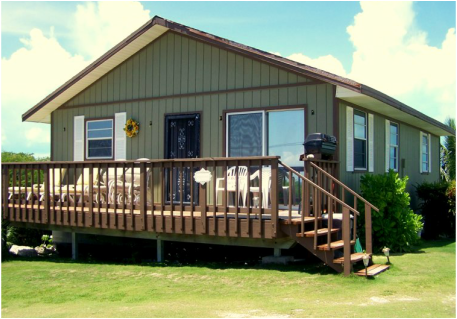 Two bedrooms, both with KING-sized beds, a Queen sized sofa sleeper in the living room, two full bathrooms, WIFI, satellite television, and central air conditioning ensure complete comfort.